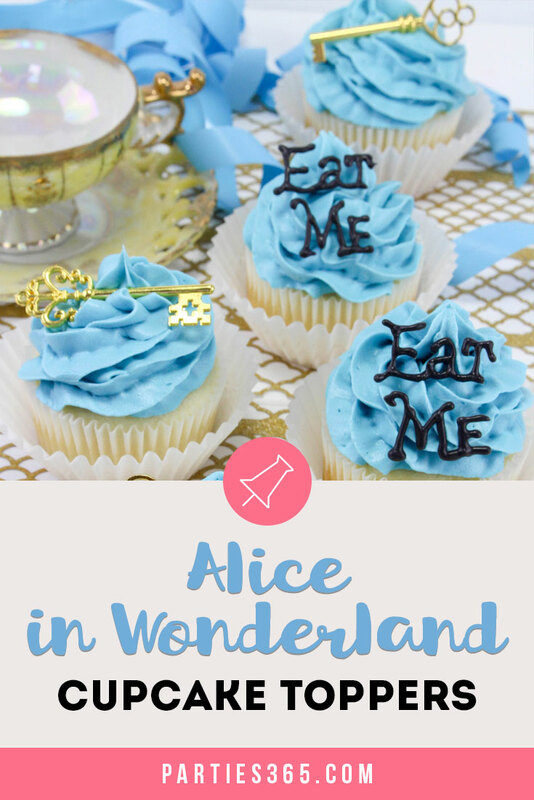 Delightfully whimsical and full of unique characters, Alice in Wonderland is a fabulously fun theme for a birthday party, baby shower, playdate or tea party! 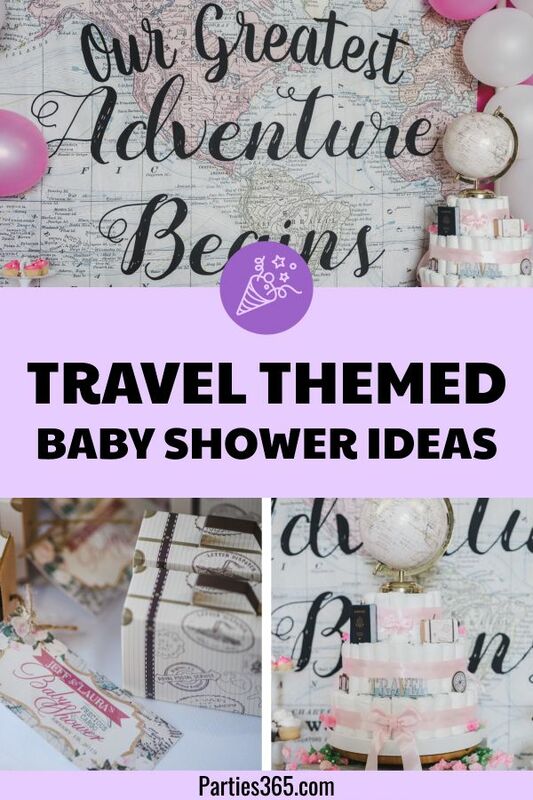 Some of the best party themes naturally lend themselves to playful decor and food where you can let your imagination run wild and Alice’s adventures definitely lend themselves to that! 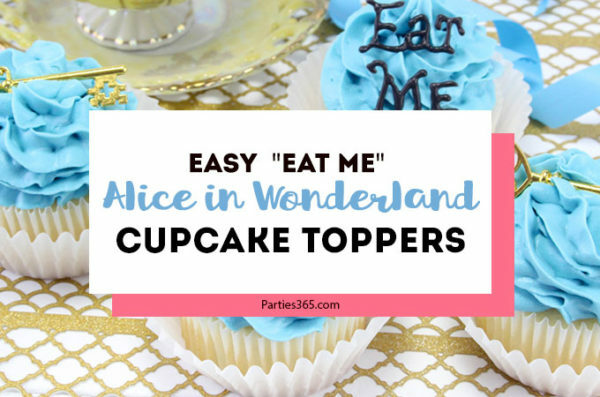 Won’t you join me down the rabbit hole as I share an easy way for your to capture this classic storybook tale in an enchanting – and easy – Alice in Wonderland Cupcake! Alice in Wonderland follows the wanderings of a young girl after she falls through a rabbit hole into a fantasy world with whimsical creatures like The Mad Hatter and the Cheshire Cat. If you recall, her adventure really begins when she finds a small key to unlock a tiny door, but she’s too large to fit through the door. First she shrinks herself with the potion inside a bottle labeled “Drink Me,” but she gets too small and can’t grab they key. 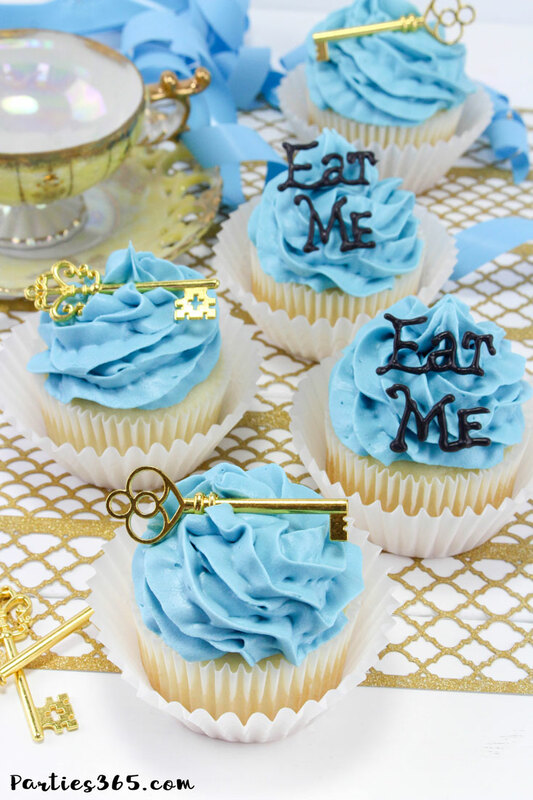 Naturally, she reaches for a cake with “Eat Me” written on it to grow back to the right size… and there you have the inspiration for these charming Alice in Wonderland cupcakes! Let’s talk cupcakes, shall we?! 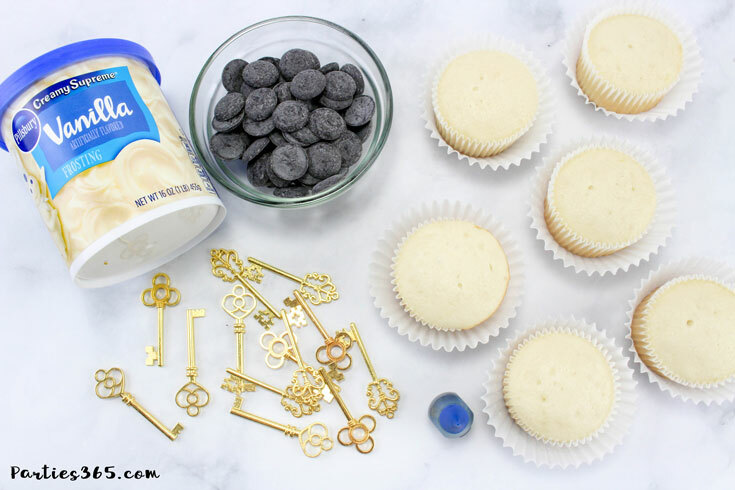 You are welcome to make your cupcakes from scratch, using your favorite recipe, although I do recommend you choose something white (or at least something that will match the blue frosting). Or, if you want – or need – to save time (or maybe you’re not really a baker) just pick up some pre-made white cupcakes from the store. No need to feel guilty about it – I promise no one will notice since you’re going to make the tops of these cupcakes unbelievably cute! Once you have your supplies together, decorating is easy and quick! First, you’ll turn your frosting blue by mixing in 5-6 drops of blue food coloring. Next, you’ll put your frosting into a piping bag or baggie with a star tip. If you don’t have a star tip, no worries, just snip the corner and pipe frosting onto each cupcake. You’ll set these aside while you finish the next part. Now for a little fun with the “Eat Me” wording! Start by melting the chocolate according to the package directions. Next, place the melted chocolate in a sandwich size baggie and snip the corner a tiny bit. 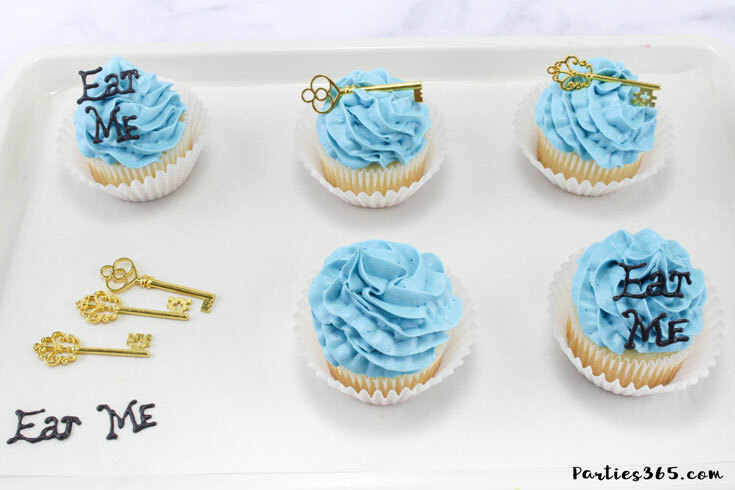 Then, on a piece of parchment paper, write the words “Eat Me.” You’ll want to make sure each letter is touching in each word, so that it’s easier to pick up and place on the cupcake. Let these dry for about 15 minutes or until they harden. 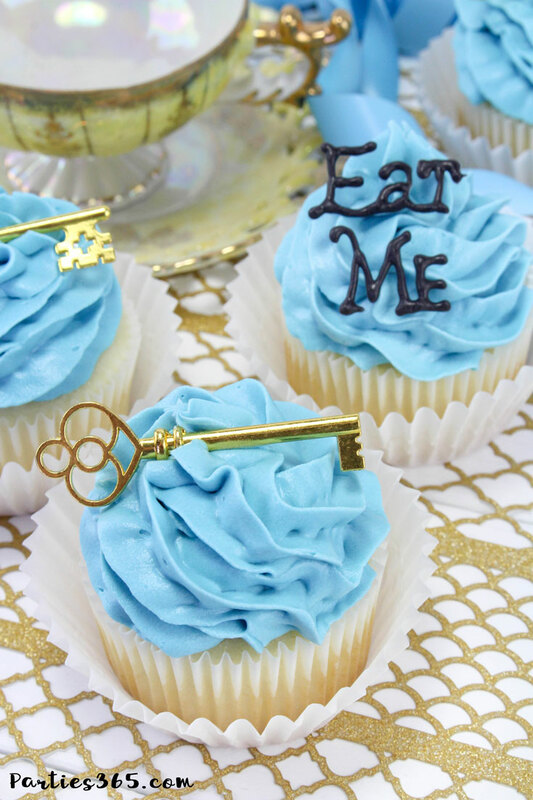 You’ll finish these beauties by placing a gold key on 3-4 cupcakes and the words “Eat Me” on the other 2-3 cupcakes – or whatever mix you prefer. And that’s it! Place them out at your party or hand them out at your playdate and enjoy! 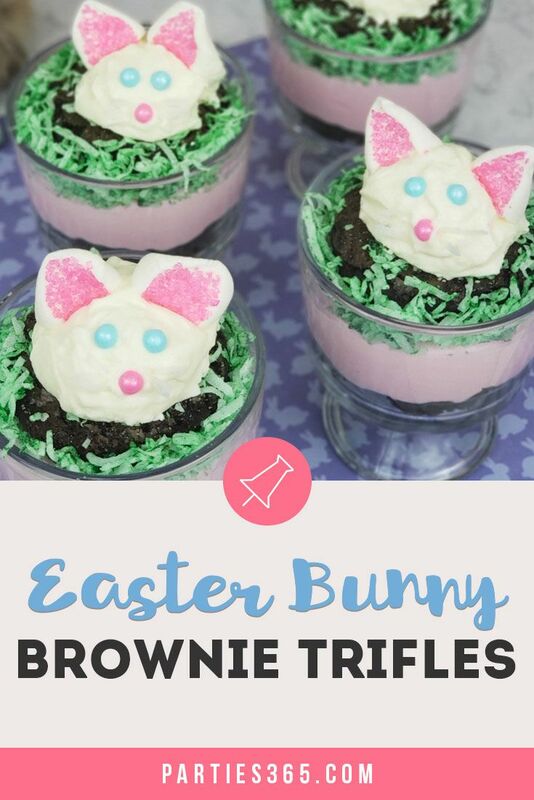 I just love how easy and quick these are to make, yet they’re really beautiful and guests of all ages will adore them! 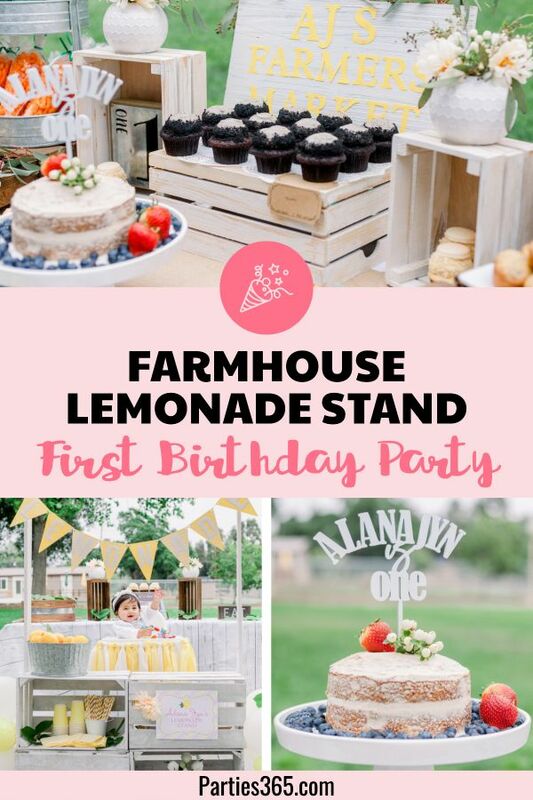 It’s a great reminder that you don’t have to be the best baker or have tons of free time to create a special little celebration and sweet treat for those you love! 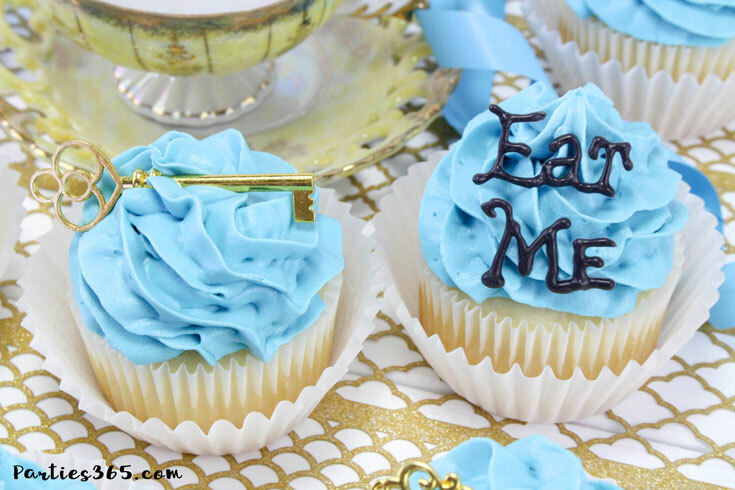 Now go make a few for your special Alice in Wonderland themed party and dare your guests to try an “Eat Me” cupcake to see what might happen next! 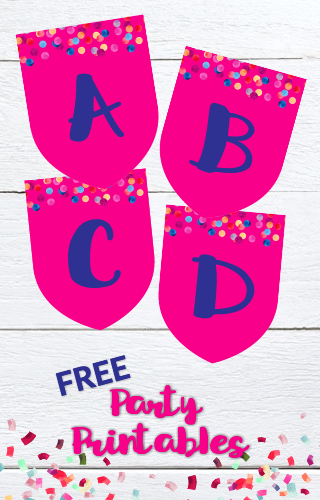 Be sure to Pin this post for later baking and party planning! 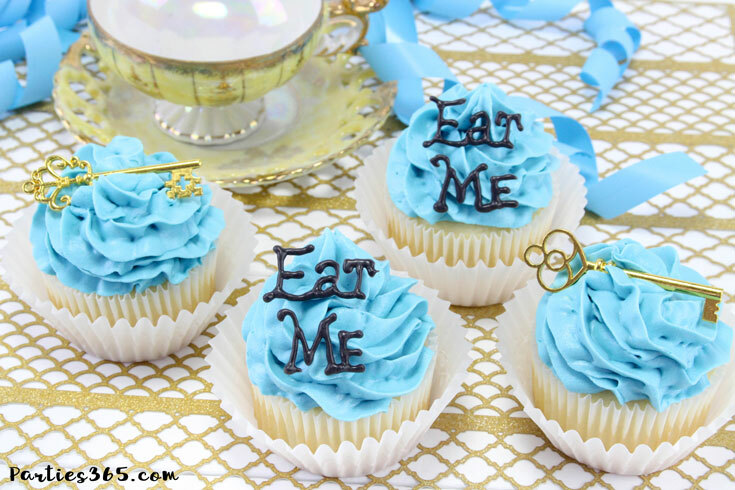 Whimsical cupcakes for a fun Alice in Wonderland themed party or shower! 1. 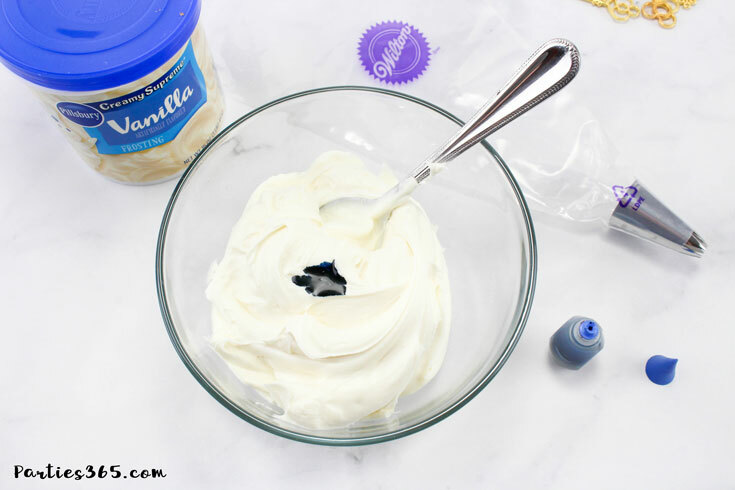 Place the frosting in a bowl and add 5-6 drops of blue food coloring. Mix well. 2. 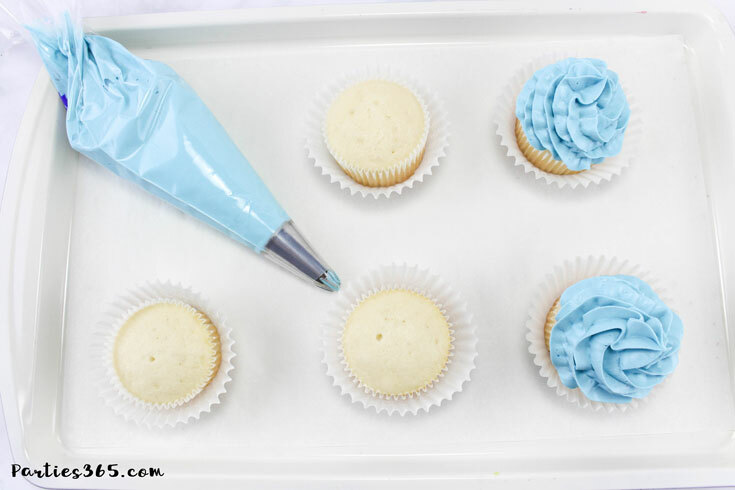 Place your blue frosting into a piping bag or baggie with a star tip. Once iced, set the cupcakes aside. 3. Melt your chocolate according to the package directions. Place the melted chocolate in a sandwich size baggie and snip the corner a tiny bit. 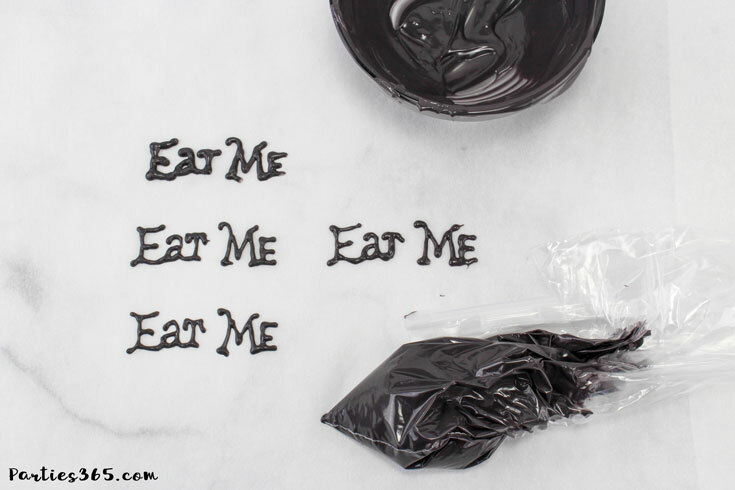 On a piece of parchment paper, write the words “Eat Me." Ensure each letter is touching in each word, so it's easier to pick up and place on the cupcake. Repeat as many times as needed for the number of cupcakes you're making. Let these dry for about 15 minutes or until they harden. 4. 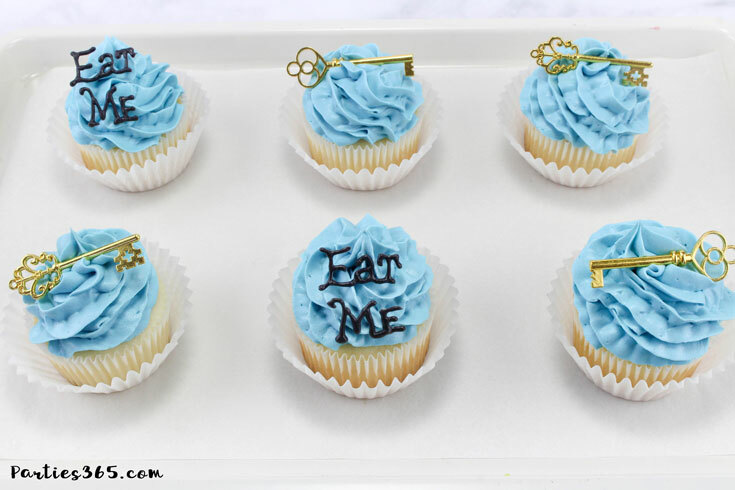 Place a key on 3-4 cupcakes and the words "Eat Me" on the other 2-3 cupcakes (or however you'd like to divide the two toppings).